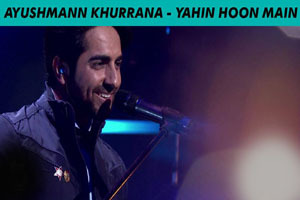 A beautiful love song in the voice of Ayushmann Khurrana featuring him in song video. The video of this song is available on YouTube at the official channel MTV Unplugged. This video is of 4 minutes 15 seconds duration. Lyrics of "Yahin Hoo Main"
Lyrics in Hindi (Unicode) of "यहीं हूँ मैं"